In April, Janet Jackson put her Unbreakable World Tour on hiatus to start a family with her husband, Wissam Al Mana. The singer, who just turned 50, didn't give any other information and quietly went about her business. But she's now putting her baby bump on display. 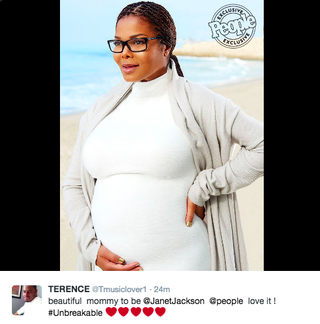 Jackson sent People magazine an exclusive photo, and she looks amazing. Congrats to Jackson and her husband!